Devices for Intermediate Tasks - A resource for people with a vision impairment due to macular degeneration, diabetic retinopathy, glaucoma and other eye conditions. 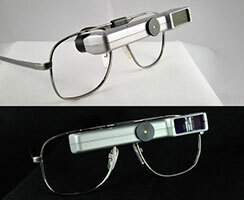 Head-worn Magnifiers: Head-worn, or hands-free magnifying devices allow wearers to see magnified images through a pair eyeglasses, visor or other lens type. These aids are intended for near viewing activities that may require both hands to be free such as sewing, crafts or small household repairs. 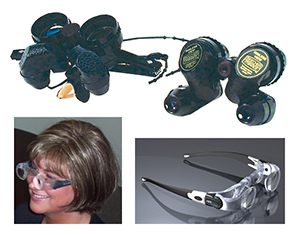 Hands-free magnifiers are available in any number of comfortable fitting options, including items worn around the head, neck or clipped on to glasses. While this group of aids is portable, they are not necessarily convenient for use on the go. Telescopic solutions:Telescopes can be hand-held or mounted into a pair of eyeglasses and designed for monocular or binocular use, meaning they can be used over one eye or both eyes. They are best used when stationary such as when working on crafts, at the computer or while reading.